0900 UTC Nov 26: Ukrainian gun boats and tug were taken by Russian military to port of Kerch, Crimea. Most countries stated their protest blaming Russian aggression and highlighting Russian violation of international laws – namely, Ukraina-Russia special agreement on Kerch Strait and Azov sea signed in 2003, according to which both Navies enjoy the right of free Kerch Strait passage and navigating on Azov sea. If incident reveals anything, it is first of all, Russian Navy and Coast Guard total lack of any plans or training to stop Ukrainian ships in some more or less orderly manner. Russian military Command was at a total loss what to do, to such an extent, that they seized nearest merchant ship, tanker, and forced it to block Kerch Strait fairway. Not to mention questionable legacy of seizure of private property, civil merchant ship with civil crew, and using it as a shield, such act in general, is considered as an act of desperation, last chance to stop oncoming overwhelmingly powerful enemy force – but there wasn’t anything like this, on the contrary, Russian forces were incomparably stronger, and there wasn’t any threat of hostile actions from Ukrainian side. Russia should be in full control of the situation, but instead, Russian Command panicked and blocked fairway with, for all practical purposes, live shield, using civil people as hostages. 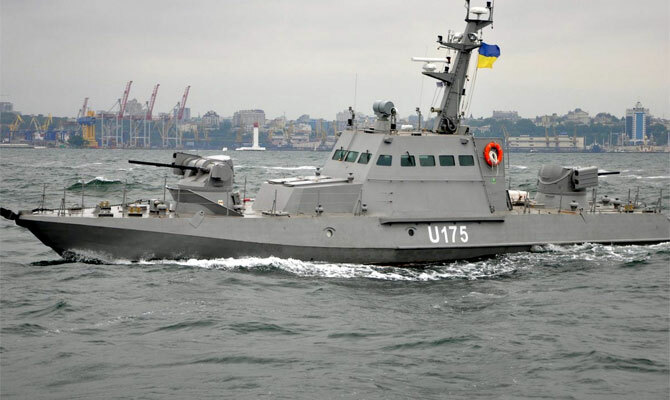 Russian patrol ship DON rammed tiny Ukrainian tug, without any explainable, reasonable purpose. Russian military response was absolutely disproportional, at least 8 Navy and CG ships, together with fighter jets and helicopters, tried to block two river gun boats and one unarmed tug. Ukrainian ships turned back and left Kerch Strait waters, Russian ships were commanded to chase them and stop them, in international waters, with permission to open fire. Russian military seized tiny gun boats after firing upon them, disabling them and wounding at least three Ukrainian seamen. Why didn’t Russian military do it in Russian waters? There’s only one explanation – local Command didn’t know what to do and how to react, Moscow didn’t know, either. Hours later Moscow decided to play tough and sent a bunch of ships to pursue and stop Ukrainian ships. It was a demonstration of overwhelming force, there wasn’t any practical meaning in it, after they failed to stop Ukrainian ships in their own waters. It was an act of revenge and deterrence, it wasn’t defence because there wasn’t any threat, in the first place. Kerch Strait was closed for all shipping long after Ukrainian ships were seized, without any reason or explanation given. It was opened at around 0800 UTC Nov 26, with hordes of ships waiting transit on both sides of the Strait. 2130 UTC: One more interesting detail – AIS in Kerch Strait is off, during last 22 hours. How did Russian Navy or whatever managed to switch it off, to block AIS signals from ships in Kerch Strait, I don’t know. But AIS is off. 2000 UTC Nov 25: Russian Navy seized two Ukrainian gun boats and tug, and as of 2000 UTC was towing them to Russian waters, ships’ crews locked themselves inside the ships and refused to surrender, so far. At least one Ukrainian sailor wounded. Both gun ships were fired upon, and damaged. 1900 UTC Nov 25: Ukrainian Navy Command reported escalation of the conflict between Ukrainian Navy gun boats and Russian Navy – gun boats were fired upon (being outside Russian territorial waters), one damaged, lost speed, one crew wounded, Russian Navy preparing to storm disabled boat. Is it an Act of War, or what? Update 1700 UTC: Russia blocked Kerch Strait with merchant marine tanker and thus, blocked the passage for three Ukrainian ships, including unarmed tug and two small river gun boats of GURZA-Class. Russia moved to Kerch Strait Navy and CG ships and boats, sent helicopters and fighter jets. After several hours of a standoff, Russia reportedly unblocked fairway, and according to latest news (not yet confirmed), Ukrainian ships transited the Strait and entered Azov sea. Shipping via Kerch Strait nevertheless, as of 1700 UTC, remains blocked, already creating huge queues of merchant ships both in Azov and in Black seas. According to Ukrainian Navy Command, Ukrainian ships are still waiting for Strait transit, surrounded by 8 Russian Navy ships, plus helicopters and jets. Russian military demands surrender, threatening to attack and seize Ukrainian ships with Spetsnaz team. Russian patrol ship DON said to sustain damages when ramming Ukrainian tug, and is taking on water. Information is very confused and changing constantly, with different sources saying different stories. Russian military Command said that the tanker which blocked Kerch Strait “ran aground” – a lie so obvious, that it can’t be commented, it’s just a shame. River gunboat GURZA-Class, Project 58150, displacement 38 ton, armament 30-mm gun, machine guns, grenade launcher. Russian Navy tried to block Ukrainian Navy from entering Azov sea on Nov 25, when 2 Ukrainian Navy small gun ships BERDYANSK and NIKOPOL, and Navy tug YANA KAPU, transited Kerch Strait, while en route from Black Sea Navy Base to Ukrainian Port of Mariupol in Azov sea. Russian patrol ship DON rammed Ukrainian tug, damaging hull and superstructure, tug’s engine also sustained damages. 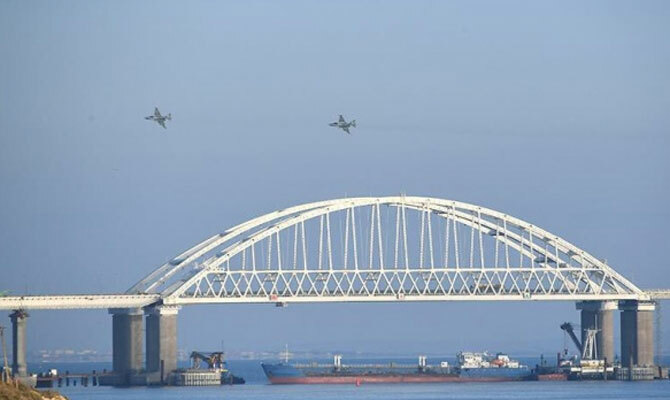 Russia moved to Kerch Strait additional forces and for reason unknown, closed Kerch Strait under Kerch Bridge with tanker, positioning it across the fairway. Russia said Ukrainian Navy broke into Russian territorial waters and Russian inner sea meaning Azov sea, both statements being glaring lies. A 2003 treaty between Russia and Ukraine designates the Kerch Strait and Sea of Azov as shared territorial waters, free for the passage of both Navies ships. Ukraine notified Russia in due order on three ships passage, but Russia nevertheless, attacked Ukrainian ships and accused Ukraine of provocations. According to latest news and as of 1500 UTC Nov 25, Kerch Strait is closed for all shipping, meaning that all Azov sea ports, both Ukrainian and Russian, are blocked. On photos Russian Navy ship DON ramming Ukrainian tug; tanker blocking Kerch Strait fairway.